Mid-Argyll Community Hospital and Integrated Care Centre is a new build healthcare facility designed in direct response to developments in rural health service delivery by NHS Argyll and Clyde and enables the Trust to provide a modern “Primary Care” service integrating primary care, community health, hospital and social services under one roof. 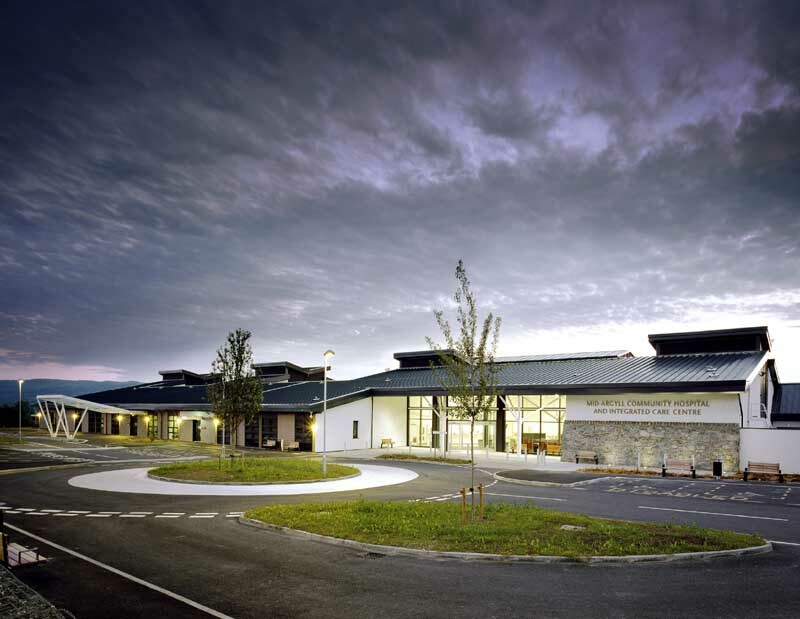 An imaginative solution was developed in response to the physical constraints and opportunities presented by the topography of the site at Lochgilphead and the Hospital reflects the new care model for NHS Argyll and Clyde with a sympathetic yet contemporary design which accommodates at its heart the new GP Practice Service Centre closely integrated with modern out-patient Services, acute in-patient services, obstetrics, accident & emergency and x-ray facilities together with services, children’s and community services all at the same level as the main entrance. The clinical functionality of the building was ensured through extensive consultation with end user Health Professionals and analysis of the required functional content and anticipated activity levels, while all interiors finishes seek to create a homely, pleasant environment for patients. The resultant design carefully responds to the difficult topography of the site and the new building is designed to minimise impact on site whilst maximising the opportunity for access with the creation of two ground floors. The Hospital reflects the new care model for NHS Argyll and Clyde by accommodating at its heart the new GP Practice closely integrated with modern Out-patient Services, Acute In-patient Services, Obstetrics, Accident & Emergency and X-Ray facilities in order to facilitate ease of use for both staff and patients. Access to the main day services – Social, Dental and Children’s and Community is also improved through housing them at the same level as the main entrance. This adjacency arrangement ensures that access is improved and that future flexibility and inter-changeability is optimised. The health professionals also felt that Occupational and Physiotherapy facilities would be best located on the lower level and integrated with the in-patient accommodation for Elderly Care and Dementia Care services where they could benefit from a quiet location. 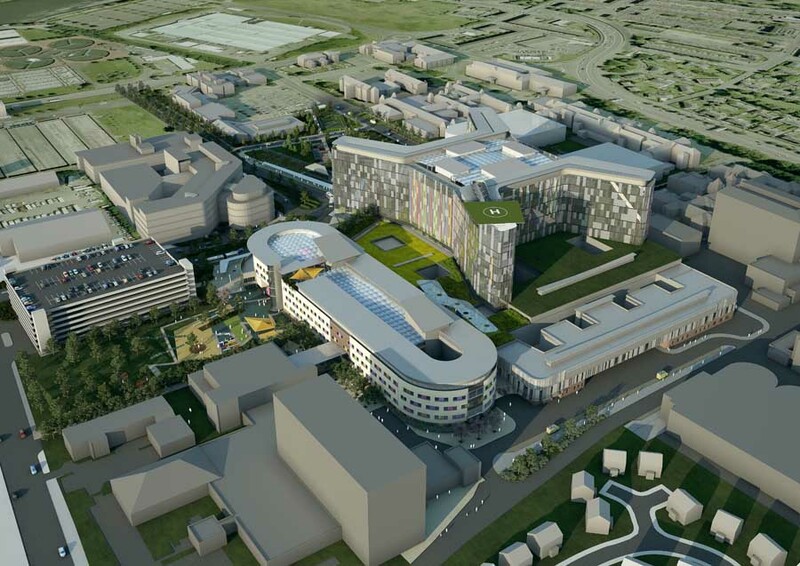 As such they are located away from the main hub of the hospital and have direct access to external terraces and landscaped amenity spaces including sensory garden. Here patients, visitors and staff can enjoy the afternoon and evening sunlight together with the best views of the loch and surrounding hills, afforded by this south westerly aspect. 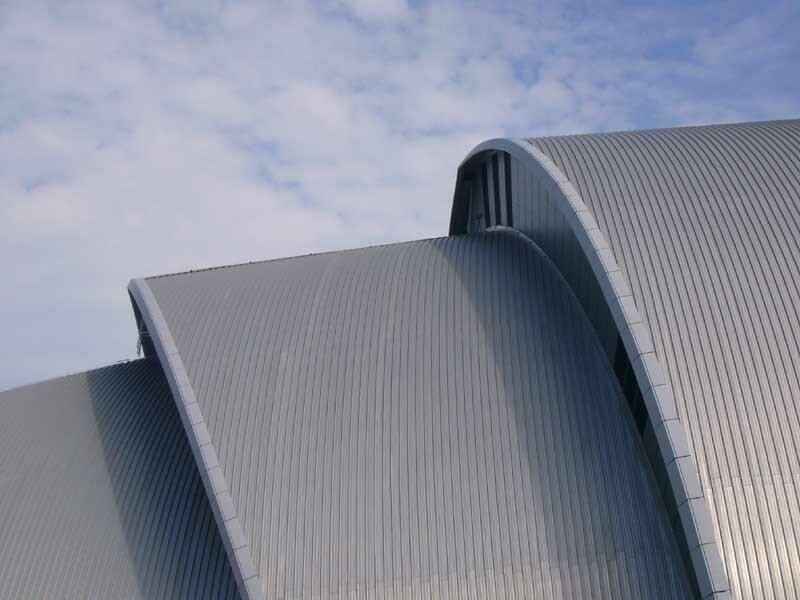 Natural daylight and ventilation were both central to the design. Natural daylight throughout the building is optimised with large areas of glazing to the elevations while orientation and solar control glazing employed for south and south-west facing windows provide unwanted solar heat gains. 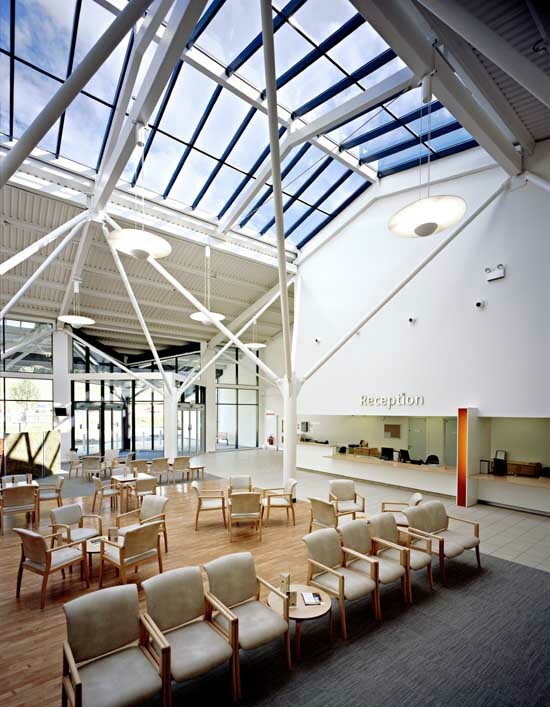 Priority for natural light is given to patient areas and rooms where staff spend significant periods of time. Ventilation in the building is predominantly natural, and mechanical ventilation while limited has been included in certain areas to ensure patient comfort where excessive heat gains may occur. The majority of windows throughout the hospital are openable, courtyards provide natural ventilation equivalent to that achieved on the outer perimeter of the building, while windows on the curtain walling of the east elevation counter summer temperatures where the window to wall ratio is high. Design calculations carried out on our in-house simulation tool HLM Win Des (verified by BRE) indicate that the 4 bed wards with fully openable windows is capable of 3m2 of free air, which far exceeds the 1.5m2 (1/30 floor area) as required in building regulations. Locally sourced, natural materials were used throughout the design and construction of the scheme and a key aspect of the main entrance design was the use of reclaimed stone from the site ground work in the building construction, predominantly in the creation of a ‘dry-stone wall’ built using traditional Scottish building techniques. The landscape design for the building, while not yet fully matured, reflects the locality of the building with a range of native trees such as Scots Pine, Native Cherry, Beech, Birch, Hazel, Oak, Ivy and a sustainable urban drainage system, which through porous paving, filter drains and on-site storm water attenuation, ensures water run-off to the river is in keeping with green field site location.